As Jimmy Spithill’s ORACLE TEAM USA looked to seize back the advantage gained by Peter Burling’s Emirates Team New Zealand on day one of the America’s Cup Match, the Kiwi Challenger recorded two more back-to-back victories over the Defenders of the America’s Cup, putting themselves 3-0* up in the first-to-seven series that will determine the winner of the 35th edition. 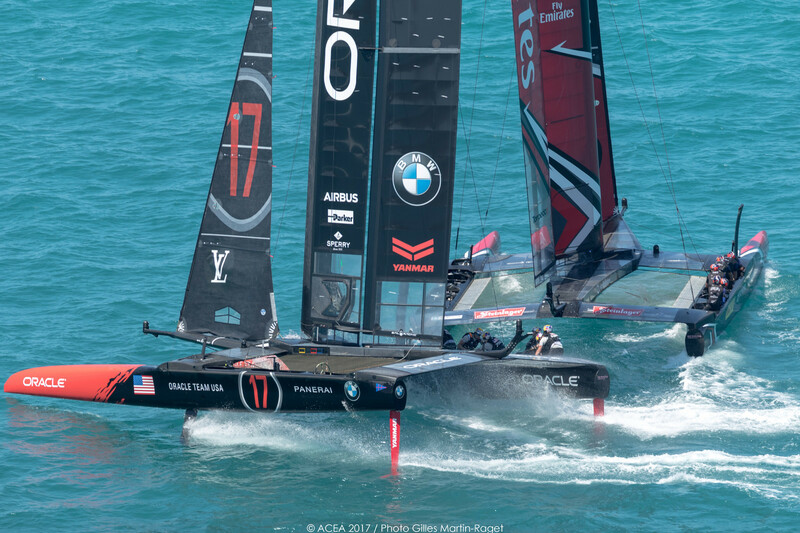 After racing had finished on day two, Jimmy Spithill looked ahead to the five day break before racing restarts on June 24 and what ORACLE TEAM USA can do to put themselves back in the fight. “These are going to be the most important five days of this America’s Cup campaign for us,” said the twotime winner of the America’s Cup. “Nothing will escape our eyes, I can guarantee that. Whether it is system related, appendage related, sailing technique or strategy, we are going to look at absolutely everything. In reply, despite knowing that repeating the opening weekend’s performance when racing resumes on June 24 would confirm Emirates Team New Zealand as the 35th America’s Cup champions, Burling again warned his team against complacency. At the start of the race, both teams were extremely close as they crossed the start line, and ORACLE TEAM USA had a small advantage to windward as they approached the first mark. However, in similar scenes to day one’s two races, a small mistake was to prove pivotal as a poor jibe by ORACLE TEAM USA saw the American boat make a small splashdown into the water, resulting in a loss of momentum that they were then unable to claw back. The second race of the day started in almost identical fashion to the first race, with both teams racing extremely closely to one another as they crossed the start line, quickly accelerating to around 40 knots as they headed towards the first mark. But the windward position of the kiwis, plus good speed, saw the Challenger drop in front of the Defender to lead at Mark 1. * Scoreboard: While the Challenger has won all four races, their match score is 3-0. The Defender, won the Qualifiers held on May 26-June 3, began the series with a one point advantage. As the rules detail, the Challenger would carry a one point disadvantage (i.e. minus 1), meaning they will need to win eight races to take the trophy whereas the Defender need only win seven races. Schedule: The dates of the Match extend from June 17 to 25, though will end earlier when a team scores 7 points. The next race day is June 24 and will continue daily thereafter until there is a winner.